The Lake Water System includes our Inline Chlorinator™ and Retention Tank to kill bacteria and neutralize odors (swampy, rotten-egg, musty), control algae, as well as address color or brown, red, orange, yellow or black staining. 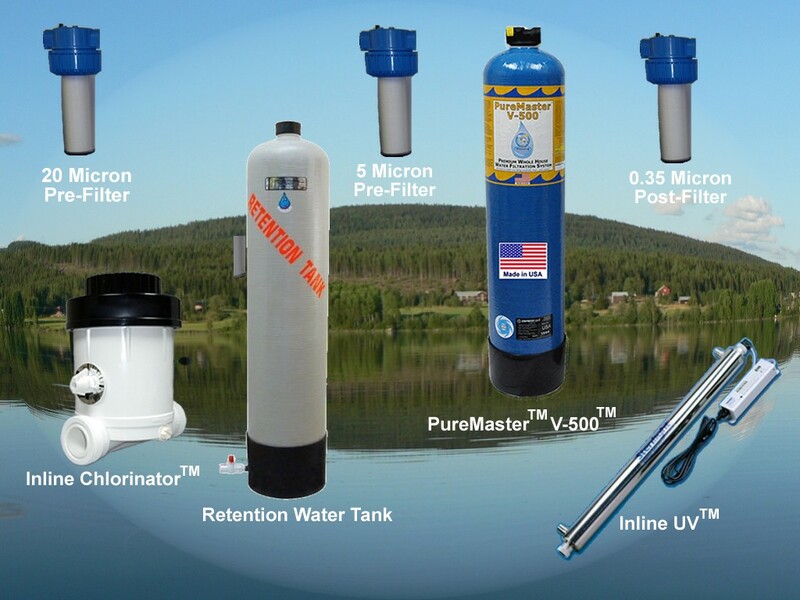 The Lake Water System is a total solution for lake, pond, creek, and rain source water that will provide water throughout your entire cottage or house which is safe to drink and generally better than bottled-water quality. The Lake Water System includes our Inline Chlorinator™ and Retention Tank to kill bacteria, neutralize odors (swampy, rotten-egg, musty), control algae, as well as address color or brown, red, orange, yellow or black staining. 20 Micron Pre-Filter (large sediment and particulate). Change roughly every 3 months. Inline Chlorinator™ (for source water with bacteria or swampy odor generally occuring during the summer months). 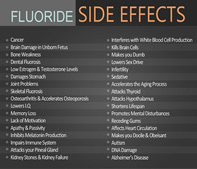 Change chlorine every 2-3 months. Retention Tank (provides necessary contact time to properly oxidize iron, hydrogen sulfide, neutralize odors, bacteria and color). Purge Retention Tank weekly or every two weeks for 60 seconds. 5 Micron Pre-Filter (finer sediment and particulate). Change roughly every 3 months. PureMaster™ V-500 (to address chemicals, contaminants, odor and taste). Inline UV™ (to kill bacteria, viruses, and parasites). Change bulb annually. 0.35 Micron Post-Filter (micro elements and cysts, comes with PureMaster V-750). Change roughly every 6 months. Plus, other miscellaneous installation components/parts. Note: The shut off, drain and check valves are not included but are recommended for installation. The advanced chlorinator, the Inline Chlorinator, is designed for ease of use on wells and helps to control iron, iron bacteria, and sulfur. The unit uses pellets that last for 60 to 90 days—much more convenient than other chlorinators which require addition of chlorine once each week. All instructions for installation and maintenance are enclosed. The Retention Tank must be purged periodically to discharge any heavy particulates that settle to the bottom of the retention tank (once per week or so for 60 seconds). See the installation and maintenance manuals for details. The PureMaster V-500 typically will perform for 500,000 gallons. It will address chlorine, chloramine, trace heavy metals, pesticides, VOCs, sediment and particulate, foul odor, taste and discoloration. The Inline UV system is designed to address 99.999% bacteria, viruses and parasites including E.coli, coliform bacteria and e.coli. "I live in an area that has many coal mines and strip mines. The wells in this area produce undrinkable water. The cost for city water was going to be over $30,000 to run water lines to my house. Because I live next to a lake I investigated the possibility of filtering the lake water and drinking it. My research led me to purchase a Vitasalus system. Although the water looked extremely pure after filtration I was still a bit skeptical. I sent a sample to a lab and they told me it was cleaner that any city system! The Vitasalus people were very knowledgeable and honest in their assessment of my needs. They now have a customer for life! I could not be happier with my system." by clicking below on "Order NOW." Free Expedited Shipping: Shipping is expedited to occur on same or next business day, depending on time of day order is received. Free shipping includes UPS ground shipping only; please contact us if you would like to ship this product differently at your own costs. Shipping is 100% FREE within the USA mainland. Outside the USA mainland, shipping is FREE up to $75. If shipping should exceed $75, customers will be contacted with total shipping costs for final approval before order is processed. Inline Chlorinator™, PureMaster™ and Inline UV™ are trademarks of Vitasalus, Inc.
Water never better!, Review by Jeff W.
Just wanted to follow up with how helpful you guys were with getting everything to me so fast, I'm very appreciative of your efforts. We installed and it's up and running. It works great, and our water has never looked better! We purchased this unit last year for our cottage. We take water from the lake. Happy to say that we now have crystal clear water, it took me a while to install. I would have given 6 stars if they included all the fittings to connect these together, just to make it easier to install. But I do understand that each install is a little different. We are just getting the system back together now for this year and once up and running will send in the water for testing to see if it gets it clean enough for drinking. Pretty impressed what is does visually and removes the funky smell of the water too. Best system for making lake water safe!, Review by Adam S.
After much time spent doing research on water systems and speaking with a rep from Vitasalus it was an easy choice to go with their system. By trade I'm an industrial HVAC tech, clean water is a big part of my job so I knew what I was looking for. I have a private lake on my rural property that is also my full time residence most of the water is run off from the hills so water is less then safe to drink right from the lake. after system was installed two tests were sent in to a lab, one of the lake water the other from the system. The results were great, actually spoke with the lab due to the results as they wanted to be sure the test samples were from the same source. the only other condition I still have is a hardness level around 260 but a water softener fixed that. Great product and really good prices the support staff is great to talk to for any questions. 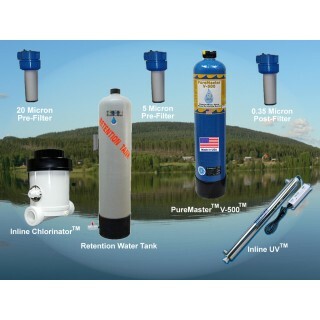 Great luck with Lake System, Review by Tom J.
I've had great luck with my Vitasalus lake water filtration system and wanted to reach out regarding my new home. We have a well that has hard water, but we have a softener to take care of that. The well itself carries a lot of sediment, which has a 4" x 20" 50 Micron filter. Our toilets, sinks, showers, etc. get a rusty coloring within a day of cleaning. We definitely need a better set up and I'm seeking your expertise. I have the test results from before the softener and after, which I'd like to send for your review. Please let me know a good e-mail address to send this to.